FARI All in One Multifunctional Rechargeable Electric Hair Trimmer Grooming Kit is a perfect choice for the men those who stay on travel for a longer period and for the professional hairdressers. 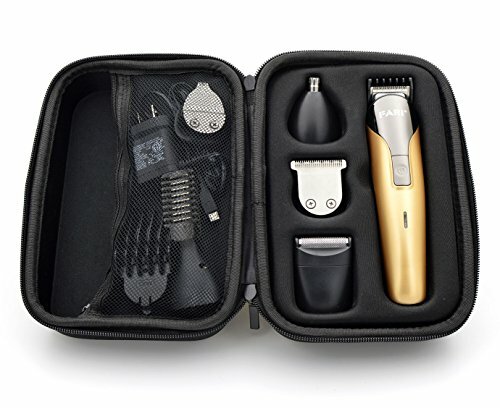 The kit comes with attachments – Nose, Ear, Beard Clipper and Mustache Trimmers, Shaver Suit & Hair Cutter and added with battery and sharper blade as add-on attachments. The trimmer runs on rechargeable battery, which requires the universal voltage of 100 – 240 V and even by the micro-USB connector on can charge the battery. This is the most welcomed feature wherein men those fly & travel a lot can trim themselves on the go. Moreover, all the attachments can be able to detach very easy to rinse and clean wash with running water, and there is no need to sit and rub to wash the trimmer. The kit comprises of four different sets of guide combs – 3 mm, 6 mm, 9 mm and 12 mm in sizes for helping men to achieve a wide range of hairstyles and lengths. Those combs help to make new hairstyle, shaping the existing style and trimming to different lengths & styles. The blades of FARI are quite sharp and remain in the same sharpness as on the day one. It provides high-performance precision cut, wherein the blades are made up of stainless steel giving you no worries on getting rust. The battery lasts for about 120 minutes and so after that, the user should be cautious in recharging the kit. This FARI all-in-one Multifunctional Rechargeable Electric Hair Trimmer Grooming Kit matches to all types of skin sensations and perfectly provides the best styling solutions for all types of hair. Since it weighs less and looks compact in its premium pack, one can carry it easily and the best option to gift your beloveds too.